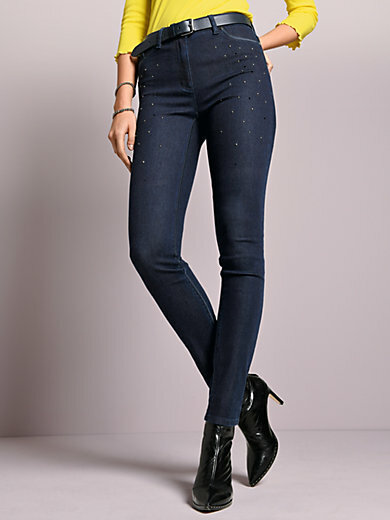 Jeans by AIRFIELD – skinny jeans: extra-narrow 5-pocket design for a flattering, feminine fit. Made from top-quality denim with a soft feel and discreet embellishments comprising appliqué metal discs and rhinestones at the front. Belt not included. 39% cotton, 38% lyocell, 15% modal, 6% elastomultiester, 2% elastane. Inside leg length approx. 33ins. Ankle width approx. 12ins. The jeans are machine washable.